setting radiators - Not an easy task as it may seemAt first glance, suggesting the presence of as theoretical knowledge and practical experience, because the slightest inaccuracy can result in service problems. If you had not had to deal with this kind of work, step by step instructions and videos will provide invaluable assistance. As already mentioned, quality installation of radiators is impossible without theoretical knowledge. 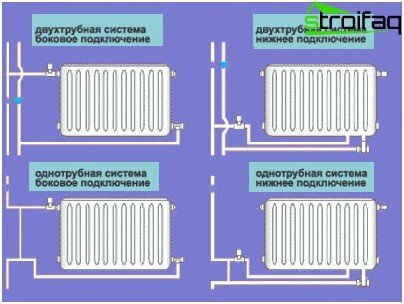 First of all, you must have an idea of ​​heating systems and methods for distributing batteries. 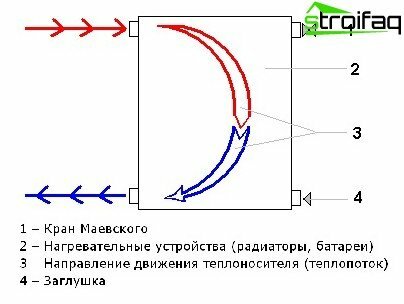 Today widely adopted two heating systems: one-pipe and two-pipe. 1. One-pipe heating system. Hot water supplied to the building, the radiators runs down from the top down. This system is implemented in almost every standard apartment. 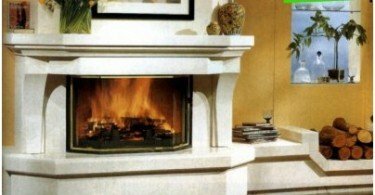 The disadvantage lies in the impossibility of adjusting the temperature without the installation of additional structural components. Moreover, such an arrangement, the water on the lower floors will be much colder than in the top. 2. Two-pipe heating system. In this case, the hot water circulated through a conduit and return pipes (ostyvshaya) - on the other. 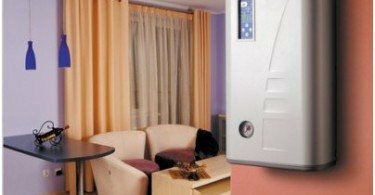 This heating system is used in cottages and private homes. 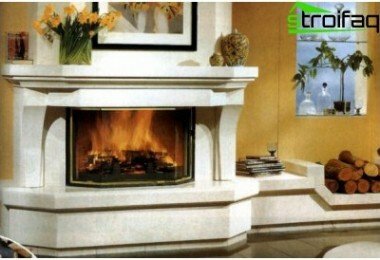 The main advantage - the constancy of the temperature of heating devices and the ability to regulate temperature. 1. Lateral connection - the most sought-after, as it helps to achieve maximum heat transfer. Inlet pipe is joined to the upper nozzle and tapping - to the bottom. When connecting the contrary (fluid flow from the bottom) power decreases. 2. Diagonal connection optimal for long radiators. Such a method would allow the battery to heat uniformly. The feed pipe is connected to the upper nozzle on the one hand and tapping the lower - from the other. It is important! Battery power feeding coolant decreases below 10%. 3. Bottom connection. This type of wiring is used when the heating system is hidden in the floor. Compared to lateral heat transfer efficiency in this method it is reduced by 5-15%. 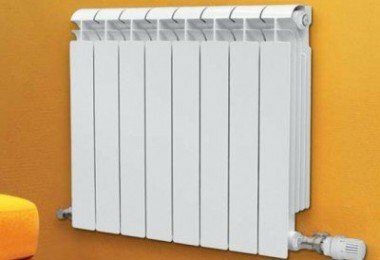 Heating radiator to be installedstrictly horizontal or slightly sloping towards the pipe. What is it for? At the end of the heating season (after draining the water), it is imperative that the battery is dry. 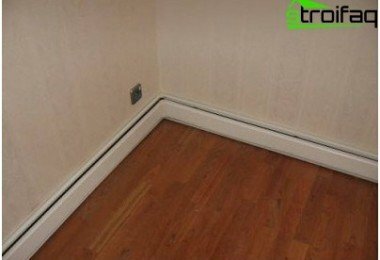 With a minimum slope in the direction of the pipe radiator will blend completely. It is important! Batteries placed at a height of 8 cm from the sill 10 cm - from the floor and 5 cm - from the wall. 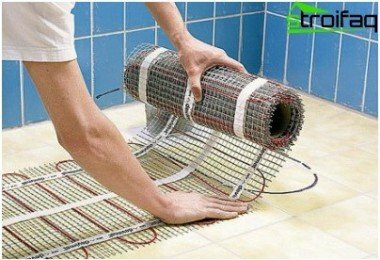 Heating batteries involves, firstturn, processing the wall that you want to align and plastering, ie prepare for finishing. 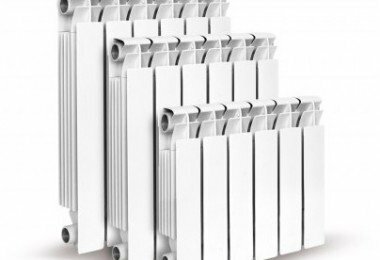 It should be taken into account during the installation of aluminum and bimetal radiators that these heating devices should be in the package until the completion of all the work and checks on the operation. Each radiator valve is installed for venting. It is important! 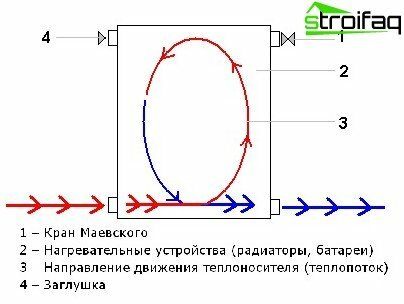 When tightening the valve force should not exceed 12 kg. Professionals advise to use for the control of a torque wrench, tighten the valve allowing a specific terminal. Before fixing to the radiators need to screwradiator caps, install the gasket and plugs, thermostatic valves. Remember, when installing plugs and adapters cleaned surfaces in contact with the gaskets, it is impossible. Otherwise, the coupling element is not completely sealed, which will inevitably lead to leakage. Brackets, which are installed on the battery,fixed to the wall by means of dowels. Permissible way when the fasteners are cemented in the pre-prepared holes technology. Hang radiator on brackets is necessary so that the hooks were between sections. Then lower bounds battery collectors enter the brackets correctly. 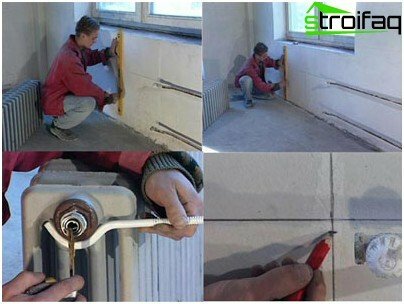 The spirit level, check the position of the heater, and it can be said that the installation of radiators Heating own hands completed. It only remains to connect the battery to the riser pipe and seal the seams with oakum or sealant. Installation of a radiator own hands: reinforcement and connection of the device to the network. 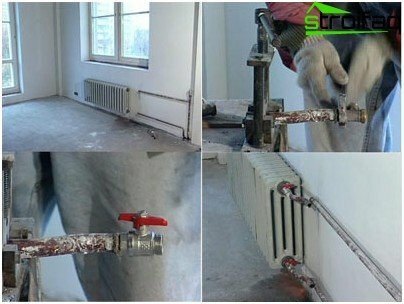 Installation of a radiator own hands complicated by the fact that it is necessary to take into account a lot of nuances, from which will depend on the quality of work. It is important! Many, focusing on the list, get ball valves with an American, but this item is exclusively for professionals in the work with which to achieve the tightness is very difficult. You can replace them with radiator valves. between the radiator pipes need jumpers thatshould be placed before the valves, ie so that when switching off valves, the water held by the webs, and then directed to the riser. 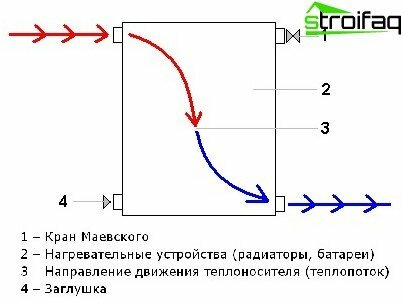 Failure to follow this simple rule will disable the heating of the lower floors.